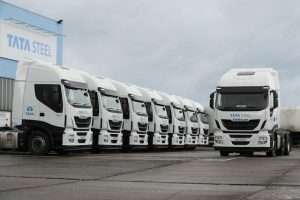 Tata Steel has replaced the truck fleet at its Lisburn site with eight Stralis Hi-Way tractor units – the steel production giant’s first UK order from Iveco. The 6×2 twin-steer trucks will operate from the facility in Moira Road and transport steel products around the region, and over the border into the Republic of Ireland. Delivered by Newtownabbey-based Iveco dealer NI Trucks, Tata Steel’s new Stralis tractors (AS440S46TX/P) were supplied with a three-year Iveco Elements repair and maintenance package and liveried in Tata Steel’s white and blue colours. 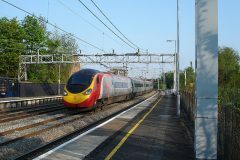 The new arrivals replace eight existing tractor units and are expected to clock up about 120,000 km each, annually. All eight trucks are powered by Iveco’s Cursor 11 engine, which produces up to 460 bhp between 1500-1900 rpm, and up to 2150 Nm of torque between 925-1500 rpm. The Cursor range features Iveco’s HI-SCR technology, which meets Euro 6 emissions limits without the need for forced regeneration. Iveco said this enables vehicle productivity to be increased, as HI-SCR requires neither driver involvement, nor downtime from active regeneration, meaning no fuel is utilised to burn particulates and no energy is lost to cool down exhaust gases. Tata Steel is Europe’s second-largest steel producer, operating factories at IJmuiden in the Netherlands and Port Talbot in Wales. The company also works from sites across mainland Europe, including facilities in Belgium, France, Germany and Turkey, as well as further afield in Canada and the USA.